From Spring Bank Holiday to end September, day and half day tours including mystery tours; Norfolk Broads tours etc. 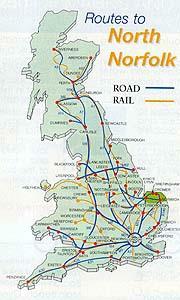 Stage carriage throughout North Norfolk including Sheringham, Blakeney Wells, Fakenham, Mundesley and Norwich. For full local bus timetables phone Sanders direct. Contact numbers: Fakenham 01328 862505, North Walsham 0500 863700, Holt 01263 712800.